What I’ve learnt from 12 months with CBD – Steal These Thoughts! This article is a follow up to one I wrote in early 2018 about my initial research and experiences from my first 2 months using CBD oil. I’d encourage you to give this a read before you jump into this follow-up, especially as I won’t be repeating myself here with context on what CBD oil is or its history. Let’s go through a quick catch up. I’m still using the same brand and strength of CBD I referenced in my first article, which I feel allows me to give a definitive view of how effective the oil is as I’m not constantly changing the test parameters. What has slightly changed is the dosage that I use. In my post from 2018 I stated that I use between 5-10 drops per a day or every other day and in the last 3-4 months I’ve opted to increase this to a maximum of 12 drops over a 24hr period. I can’t say I’ve noticed a huge difference from this increase, yet from time to time I’ve found a little more calm from this but of course this could be all placebo. My reason for first purchasing CBD oil was due to the effects that have been reported and I feel sometimes over exaggerated for those who struggle with anxiety and depression. I still feel and even more so nearly 8 months later that CBD can help with mental health issues, particularly anxiety, but it is neither a cure or a financially sustainable option for many. I say this as I still firmly believe that no singular thing will ever provide calm from the mind and it is in using a number of tools that you can learn to manage your own demons. As an example, the dosage that some need to help with anxiety just to cover a few days costs an astronomical amount, which in my opinion isn’t a sustainable return on investment. I feel you can find the same effects in pursuing other activities that can allow you to understand the mind and find what helps you manage the challenging thoughts, not just in this oil. Of course these are all just my opinions from my experiences and your own experiences may well be different, so don’t feel like what I’m saying is the definitive on all things linked with CBD. If it works for your own problems, then great keep using it and I’m happy you’re getting great results. As always, I encourage anyone as in my original post, to give it a try, experiment yourself and see what happens. The natural flavour still tastes like crap but it’s grown on me and I have minimal issue with it now. The affect you desire is all about the volume of CBD you purchase and the dosage you take. As mentioned I now use max 12 drops over 24hrs and have aimed my use to more than just battling the anxious mind. My sleep continues to remain strong when using approx 6-8 drops before bed and can be a real help on the days when I just can’t switch off. I’ve been experimenting with CBD as part of recovery from injuries, post – workout and the variety of niggles you can pick up in everyday life. I can report that I’ve seen good and speedy results in recovering from workout sessions and a few banged up muscles when taking drops post workout sessions. I still can’t really comment on the general effect on overall wellbeing as I use and do so many things to maintain a healthy lifestyle, although I don’t doubt that the natural benefits from CBD have helped with my general health and mood. It’s still a great tool for your kit, but it’s not a cure. Once again, I’d say CBD has a number of positives. I’ve seen continued improvements from the points outlined in my original article and a few new ones from time to time. I will reaffirm once more that despite all the hype on CBD, it’s not a miracle cure all for everything in life. I can say that I’ve felt the benefits of both calm and better sleep from CBD usage, however some can also say this might be placebo and I can’t disagree with that in some cases as it’s hard to prove this either way. It’s all down to the individual in my opinion. Something I may explore in the future and have actually been tinkering with over the past few months is to take prolonged breaks from using CBD. I’ve done this on two notable occasions so far, once over a 10 day holiday in early autumn 2018 and more recently over the festive period where I took a 3 week vacation. Over the former I don’t believe I took any CBD at all and in my recent 3 week break it’s been a very sporadic approach where I’ve probably had 6-8 drops every 3-4 days. As a quick summary on results from this – I’ve not felt a huge difference from lack of use and I feel this is mostly down to the fact I use many strategies to manage my monkey mind so it has shown me that all of these tools together serve me well. I remind you all once again that these are my own experiences and you’ll probably have very different ones, so make sure to do your own research and experiment yourself. There’s plenty of research being made available for anyone to review and make your own conclusions, so make sure to do this and don’t just take my words as the final verdict. 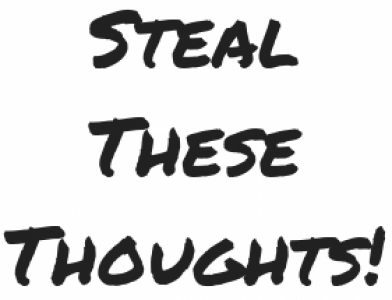 You can subscribe to my weekly Steal These Thoughts newsletter here.